Good morning friends, Lorie here with you this morning. Can you believe we are in February already? It is the month of love...well, the month of Valentine's Day. I know some people don't celebrate it because it is a commercial holiday but I am totally into showing extra love to my friends and family on Valentine's Day so how about I show you another card I made? 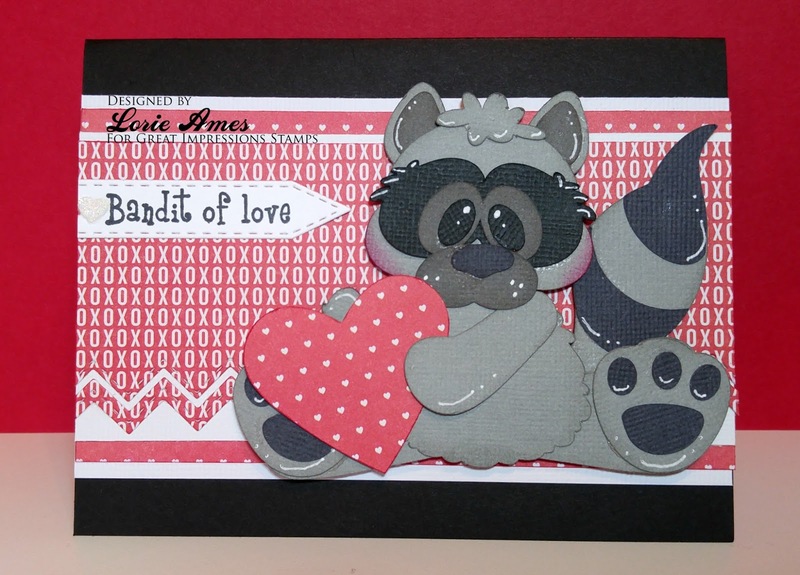 As you can see I used a fun raccoon cut file along with the Bandit of Love Stamp on the outside. 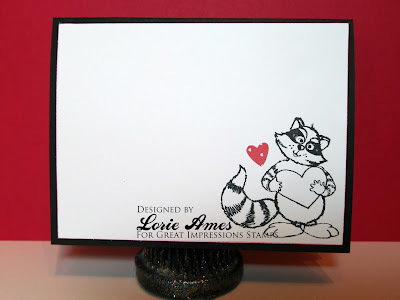 As strange as it may seem I knew I wanted to use black or grey with this raccoon for the card base but of course love calls for some red, right so I used red and white as the accent colors. My papers are from Pebbles Be Mine paper pad. A little white gel pen on the raccoon really gave it some fun character. And inside I added the Smokey the Love Bandit stamp and another little heart...can't have to many hearts in my opinion! I left lots of room for a mushy note for my hubby! I think I already made him a card for Valentine's Day but I often give him more than one throughout the day so this would be no different! I would love for you to come and join our monthly challenge. If you use a stamp from the Great Impressions online store, please link it up in our Customer Gallery, too! This is the most adorable Valentine!! I love that little bandit and the sentiment! Love that raccoon! What a great Valentine card!